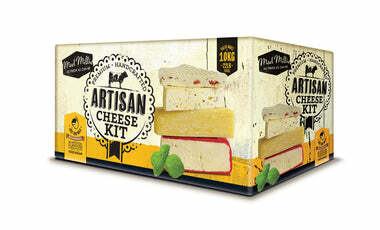 This kit contains all the equipment and ingredients to make Camembert, Blue Vien, Blue Stilton Style Cheese, Double Cream Brie and French Neufchatel. Each cheese takes approximately 1 day to create (not incl. ageing time) and is aged for between 4 weeks and 3 months depending on the cheese. NOTE: Your box may say it contains Aromatic Mesophilic Culture, Penicillium Cememberti Culture and Penicillium Roqueforti Culture but only 2 types of culture are inside. This is because we have blended the Aromatic Mesophilic Culture in with the Camemberti and Roqueforti Cultures to make it easier for you. You are not missing anything and can carry on as normal. 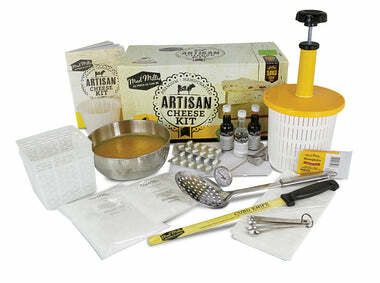 This kit is ideal for intermediate cheese makers and makes up to 7kg (15lbs) of specialty cheeses. 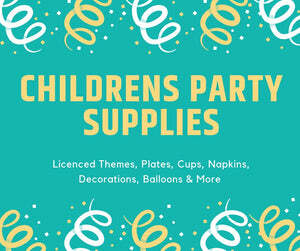 All consumables can be purchased seperately once used. 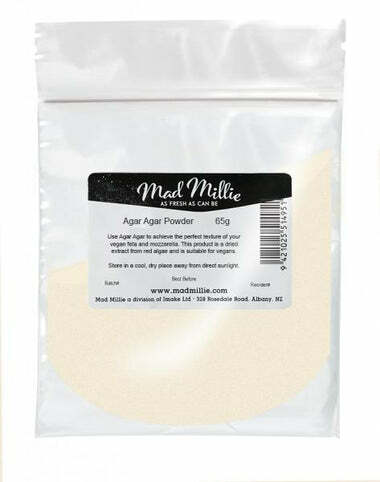 For best results, use this kit with the Mad Millie Cheesemaker (under equipment on online store). 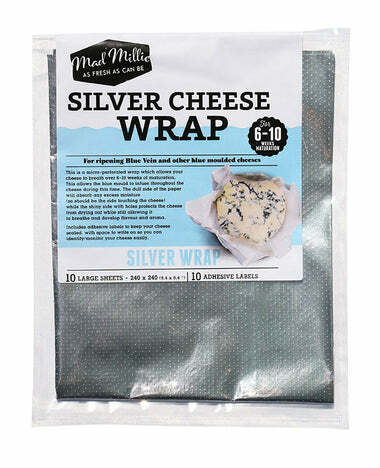 Kit Contains: Cheese cloth, Cheese Moulds (2), Silver and White Cheese Wrap 240mm x 240 mm (20 Sheets), Artisan's Cheese Salt, Steriliser, Culture for White Mould Ripened Cheeses, Culture for Blue Mould Ripened Cheeses, Vegetarian Rennet Tablets (10), Maturing Box, Thermometer, Calcium Chloride, Pipette, Kit Instructions and Recipe Booklet. This culture lasts out of the freezer (at room temperature) for 2 months so will be fine during postage. However, we suggest storing cultures in the freezer as soon as you get them in order to prolong life.